Magneto optic is a kind of skin reconstruction system which integrates epidermal cooling technology and multi-band pulsed light therapy technology as an intellectualized and non-exfoliative skin reconstruction system. Magneto optic technology intellectualizes the combination of the above-mentioned technologies, and provides targeted treatment programs for different skin types and different skin problems of patients. The speckled pigments in the epidermis and dermis (e.g. brown-cyan nevus in the face) focus the energy to the maximum extent on the collagen tissue of the dermis and the papillary head of the hair follicle. 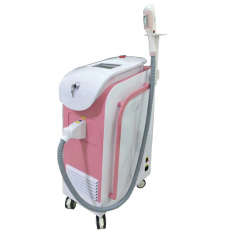 The application of magneto optical selective photo thermal principle can enhance the effect of rejuvenation, freckle removal and hair removal, and easily achieve skin reconstruction and hair removal without obvious pain and side effects. Magneto optical skin rejuvenation and depilation technology is a non-exfoliation dynamic method, which provides non-interventional methods to adapt to different skin conditions. Therefore, it is safe and effective without any damage to the skin. Does it reappears after treatment? Hereditary lesions do not reappear, such as hereditary freckles, chiliasm and red blood filaments; lesions caused by endocrine disorders or sun exposure may recur. This needs to adjust your diet structure and the rule of life. Reason 1: Energy is strong: In terms of machine energy output, magneto optical output works on our skin at least 10 times as much as opt. Therefore, the effect of magneto optic rejuvenation is much better than that of opt. Reason 2: There is no need to replace the filter: In terms of instrument operation, the magneto optic handle does not need to replace the dial, the machine automatically selects the required light wavelength, which is more convenient for our beauticians to operate. Reason 3: More hair growing: From the late consumables, the number of hairs of magneto optic gun head is 50 times the number of hairs of traditional opt gun head, and the number of hairs can be 400,000 at least. Reason 4: Better effect: Magneto optic uses the technical principle of combining perfect pulse and magnetic crystal to break up the melanin in our skin. And In the use of magnetic crystals, it extracts melanin into one of our epidermis, so as to achieve a freckle-removing effect. Reason 5: Expanding customer sources: The pigment is the rigid demand of women, and every women is the target guest. Skin with pigment of severe yellow coloring should be treated here, and the sub healthy skin should be done the pigment prevention treatment. 1. What is magneto optical beauty? Currently, the high-tech beauty projects apply the principle of magnetic crystals promoting selective photo pyrolysis and stimulation of intense pulsed light to directly irradiate the skin surface and achieve cosmetic effects of freckle, hair removal and acne removal without damaging the skin. 2. What is magneto optical rejuvenation? Magneto optical skin rejuvenation technology is an innovative technology, which can be used to solve a variety of benign skin lesions, such as skin acne marks, age spots, large pore, indecent blood vessels or other stains and remove excess hair. In order to achieve a special cosmetic effect that satisfies patients, it provides a safe, non-interventional method to adapt to different skin conditions, which is called magneto optical skin rejuvenation. 3. What is the outstanding feature of magneto optical rejuvenation technology? A. With comprehensive treatment, it can improve your facial skin condition thoroughly. B. No need to stop work, no need to ask for leaving for the treatment. C. Short time of treatment, it only takes 20 to 30 minutes each time.